The average 529 account continues to grow, reaching an all-time high of $19,584 at the end of last year. Amid a soaring stock market and improving economy, college savings stashed in 529 plans hit a record $227.1 billion last year. Investments in 529 plans grew by 19%, or $36.4 billion, in 2013, according to the College Savings Plan Network, which collected data from all of the country's 529 college savings and prepaid tuition plans. Parents, grandparents and other savers made contributions to more than half of all 529 accounts, while last year's strong stock market also provided a major boost. Excluding contributions and distributions, investments in 529 plans grew by nearly 15% in 2013. 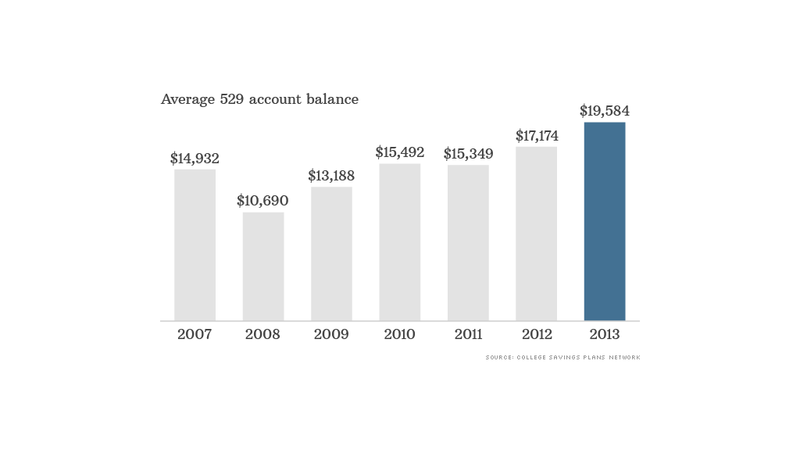 The average account size also reached an all-time high, hitting $19,584 last year, up 14% from $17,174 in 2012. While that currently would only cover just one year at many public universities, it's still a step in the right direction, the report stated. "It's important to remember that any money saved for college is money that a family will not have to take out as loans and repay with interest," the report stated. Offered by the states, 529 college savings plans allow holders to save money and withdraw it tax free, as long as the proceeds are used towards approved college costs -- such as tuition, fees, room, board and other supplies. Another kind of 529, prepaid tuition plans, lets savers prepay for future tuition and lock in current prices, but these plans typically do not cover other expenses. While the plans have been around for more than a decade, they have become increasingly popular in recent years as college costs continue to grow faster than inflation. Average costs for tuition, fees, room and board at a public university rose to $18,391 this school year, while private college costs averaged more than $40,000, according to the College Board. Tuition is expected to increase about 8% each year, meaning costs are on a path to double every nine years, according to FinAid.org, a financial aid website. Last year, college savers opened nearly 500,000 new accounts, bringing the total number of accounts to 11.6 million. "After 15 years, 529 plans have come of age," said Mary Morris, chair of the College Savings Foundation, a nonprofit that represents investment managers, brokers, government agencies and other groups that sponsor or administer 529 plans. Still, only 1.6 million accounts distributed funds last year, representing only 8% of U.S. college students, showing "the potential and need for further growth."